As you might expect, most of the products are Mac-only, but they're interesting and unique enough that any geek will appreciate them. Here are a few apps and gadgets that caught my eye during a day on the show floor. Inklet is a software add-on for Mac OS X that lets you use the multitouch trackpad on recent Apple notebooks as a graphics tablet. To use it, hit the designated hotkey; a drawing area will appear on your screen. To draw, you can either use your fingertip on the trackpad, or use the Pogo Sketch stylus ($15). In my brief hands-on, I found it a little awkward to use, so you'll probably experience a bit of a learning curve. The Inklet software costs $25, but you can download the trial from the Ten One Design site. GameSalad is a developer tool that makes it possible for anyone to create a game without having to learn how to write code. It uses a drag-and-drop interface similar to that used in Apple's Automator scripting software. Drag in an image--a space ship, for example--then add in "rules" which tell it how to respond to your interaction. In a brief demo, I dragged in a spaceship image, then assigned rules which told it to turn left when I pressed the left arrow key, and right when I pressed the right-arrow key. Using GameSalad, you can create games for the iPhone and iPod Touch, Mac OS X, and the Web. The (Mac only) development kit is a free download from the GameSalad site, though you'll need to pay an annual fee to create and publish iPhone games (fees start at $99 per year). If you're less interested in buiding games and more interested in playing them, see the GameSalad games browser. Are you a DJ or music enthusiast? If so, you may want to look at Djay. This $50 Mac application lets you remix music directly from your iTunes library. With it you can mix multiple songs, "scratch" the virtual records with the trackpad, or create an "automix," which will automatically mix your music. Djay also works with the Vestax Spin controller, a $250 MIDI controller available through the Apple Online Store. The Tunebug Shake is a portable Bluetooth speaker that's similar to the Kerchoonz K-Box: It turns the surface it comes in contact with into a speaker. In the Shake's case, the surface in question is your bike helmet. 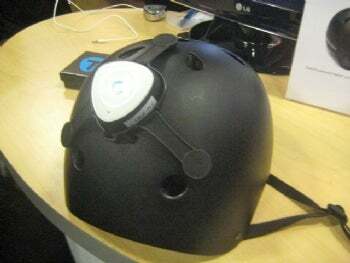 The Shake comes with two mounts: The Gecko Mount for skater and snowboard helmets, and the TuneStrap mount for more typical bike helmets. You can preorder the Shake--and its sibling, the Vibe--from the Tunebug site. The Shake costs $120, while the Vibe--effectively a corded version of the Shake--costs around $70.